As many of you know, Val Kleitz was a driving force for the Seattle holiday cargo bike rides. For us, he was the spirit of cargo bikes in general. So it’s quite fitting that this year’s Labor Day cargo ride is honoring Val as a memorial ride. The Labor Day ride traditionally runs (very roughly) from 20/20 Cycle on Union St. to Cowen Park in Ravenna. Plan on a slow, cargo-and-kid-friendly pace. Make sure you carry enough in the way of food, beverages, and picnic supplies. Just in case! We’re hoping to see a lot local riders and family cyclists showing support for Val’s memory, as well as enjoying some transportation cycling on a lovely day. As always, a cargo bike is Not Required (If you are hauling yourself, you’re hauling a load!). So come on out and join the pallet. Details: Meet at 20/20 cycles (2020 East Union) noon Monday. The Pallet leaves at 1:00 and should take about 90 minutes to arrive at the Cowen/Ravenna park picnic shelter. Later Monday night is a wake for Val at Pike Brewery. More details about both events here…. 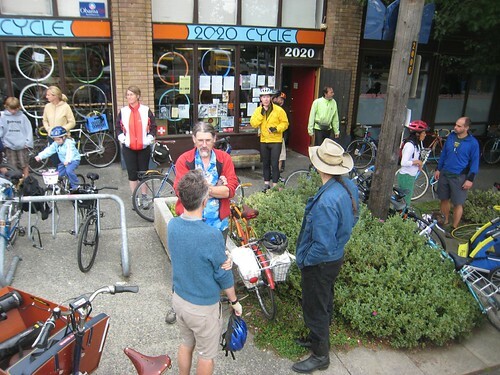 This entry was posted in alternative transportation, bigger than here, bikes, cargo bikes, Events, family cycling, seattle and tagged cargo bikes, Labor Day, seattle, xtracyle. Bookmark the permalink. I just ordered a Brompton! It is going to be perfect for getting to school using the subway (or anywhere) here in DC. Hope all is well!